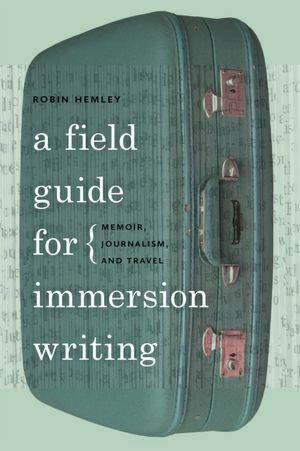 To celebrate Robin Hemley’s new book, A Field Guide for Immersion Writing: Memoir, Journalism, and Travel, we are launching a quick contest. You have one month, until May 11th, to immerse yourself, in something. If it is water, be sure that you can swim. If it is honey, watch out for bears. For centuries writers have used participatory experience as a lens through which to better see the world at large and as a means of exploring the self. Immersion writing encompasses Immersion Memoir (in which the writer uses participatory experience to write about the Self), Immersion Journalism (in which the writer uses the Self to write about the world), and Travel Writing (a bit of both: the writer in the world and the world in the writer). Types of immersion writing within these broad categories include: the Reenactment, the Experiment, the Quest, the Investigation, and the Infiltration. Immersion, by the way, is defined as involvement in something that completely occupies all the time, energy, or concentration available. So, choose one of the immersion modes and knock yourself out, except we are only allowing you 500 words. Yes, you heard us right: 500 words, or fewer. Robin Hemley, Director of the Nonfiction Writing Program at Iowa, and celebrated author, will be the judge. First prize is a copy of A Field Guide for Immersion Writing: Memoir, Journalism, and Travel and $50, second prize is a signed copy of the immersive The Accidental Buddhist, and third prize is a showercap. All three winners will be published on the Brevity blog. Deadline May 11th, 2012. Mail your entries to brevitymag(at)gmail.com with Immersion as the first word in your subject heading. Here’s an interesting writing contest to consider. . .
Are essays written in Creative Nonfiction‘s online Immersion Journalism course eligible? I know they don’t allow essays in their courses to be submitted to CNF but didn’t know about how Brevity felt about work written in and commented on by the instructors there. There is no conflict. Brevity remains loosely tied to Creative Nonfiction magazine — we are a pesky younger cousin maybe –but we have entirely separate editorial systems. Do contestants need to “immerse” themselves only during the month and then write about the experience? Will entries based on earlier immersion be accepted? Yes, past immersion is fair game. Might you post a paragraph of an example? Or point to an example? Please? I’m planning to try a medieval sourdough bread recipe. Does that count as an immersion experience or do I need to blast off to Mars? Could you also please let us know if more than one submission would be allowable for this contest? I think one per customer is best. I’m really only interested in the showercap, so I’ll adjust the quality of my writing accordingly. can previously published-online material be submitted? You are currently reading Immerse Yourself, Briefly: A Contest at BREVITY's Nonfiction Blog.